Behold - in the nick of time - my finished ETL 2018 vow to complete 6 Scimitar Jetbikes as a Sky Hunter Squadron, with a sky Hunter Sgt with Phoenix power spear of total value 270 points! Its a shame I couldn't do a second pledge, have a lovely purple Dreadclaw that is gathering dust! For those that dont know, over on Bolter and Chainsword there is an annual event called the ETL ("E Tenebrae Lux" - Or for us peasants, "From darkness, light"). It is popular, and as such is now in its 6th year. Pledges are made to a particular faction on the boards, and their points cumulative to that faction's grand total, 270 points is a poor show in all honesty, but real life does get in the way. I even put details on the control panel - a rare treat for me! In the works are a Dreadclaw, 2 10 man tactical squads, 5 more phoenix terminators, a librarian (for the IIIrd you say?!) and some more HQs.....oh, and a Spartan! Time for the main man! Praetor Lucius Tredecimus Brutus! A game of poor rolling for Ld tests - even with an apothecary, champion and 7 palatine blades the deathsworn and magic Wolves champion, apothecary chap cut them down and a spectacularly failed Ld (5 & 6) meant they ran off the table - 6" deployment zones be damned! 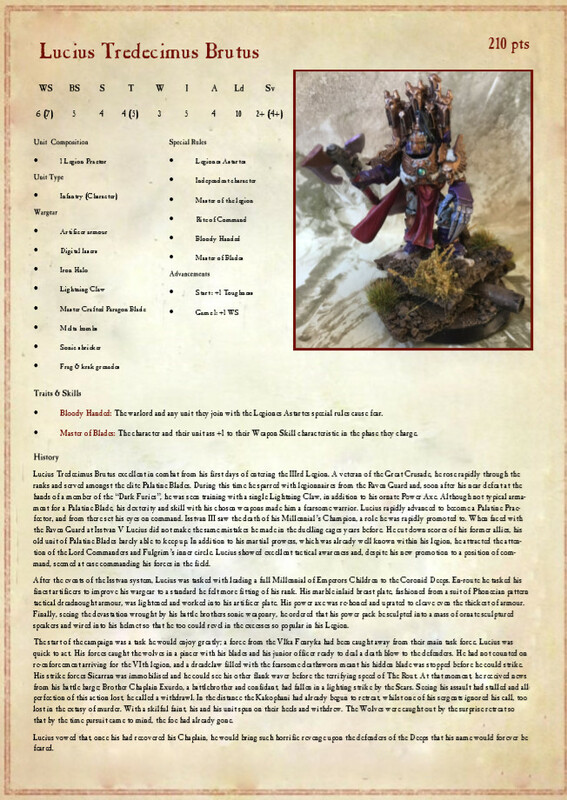 To follow on from my last post, now that I've played two campaign games its time to show off my campaign characters - today its Brother Chaplain Exurdo! Exurdo didn't fare too well in his first game - his tactical squad was wiped off the board and he was left in combat with the Scars' praetor and his whole squad! Exurdo hit hard, and in teh challenge left the praetor concussed and one wound down. However, hit and run with jetbikes meant he ran, doubled back and cut him down on the charge. Post battle he gained an attack but was captured. This is fun in and of itself; it means next month we'll have a Liberation mission to play! Finally some games played! Here in the North-West of England we have a 30K FB group. Ive watched and never joined in before, but no longer! THis month I have played 2 (yes...TWO!) whole games of heresy. 2000pts using the book IV conquest system. We have two campaign characters (with details of these to follow!) starting with one skill and one advancement. Brother Handro: "....best paint some jetbikes then eh!" More games to follow, hopefully with some success! During the hobby day this week I made start on my IIIrd Legion Librarian conversion. A relatively simple conversion, it’s a few pad changes, a Phoenix spear, and a new (god specific) summoned daemon. The work so far is all around that daemon and the associated flame effect. I aimed for a bright green flame at the claw, with a fade to black smoke around the daemonette. This merged with her robes, also black, and provided a clean backdrop for the silver armour and pale skin. Still needs some work, but it’s getting there!